Point Pleasant defenders Wyatt Pearson, left, Eddie Mayes (56) and Cameron Nott (48) converge on Meigs running back Cole Adams during the second half of a Week 8 football game in Point Pleasant, W.Va.
Last Game: Man lost to Bluefield 49-7, in Bluefield; Point Pleasant defeated Meigs 56-16, in Point Pleasant. Last meeting between the teams: Oct. 21, 2016. Point Pleasant won 41-0, in Point Pleasant. Current head-to-head streak: Point Pleasant has won 3 straight. MHS offense last week: 166 rushing yards, 10 passing yards. PPHS offense last week: 396 rushing yards, 162 passing yards. MHS offensive leaders last week: QB Larry Whitt 3-8-0 10 yards; RB Zackary Frye 16 carries, 41 yards; WR Quentin Moody 3 receptions 10 yards. PPHS offensive leaders last week: QB Cason Payne 7-11-1 152 yards, 2TDs; RB Cason Payne 9 carries, 210 yards, 3TDs; WR Josh Wamsley 4 receptions, 85 yards, 1TD. MHS defense last week: 301 rushing yards, 70 passing yards. PPHS defense last week: 138 rushing yards, 152 passing yards. 1. Along with the 41-14 victory at MHS in 2000, the Big Blacks also defeated Man by a 43-19 clip the year before. Those are the only previous meetings between the teams in the last 20 seasons before last season. 2. This is the second of three straight home games for the Big Blacks. PPHS is 2-1 at OVB Track and Field this fall, winning two in a row. Man has yet to win away from home, losing all three of its previous road games. 3. 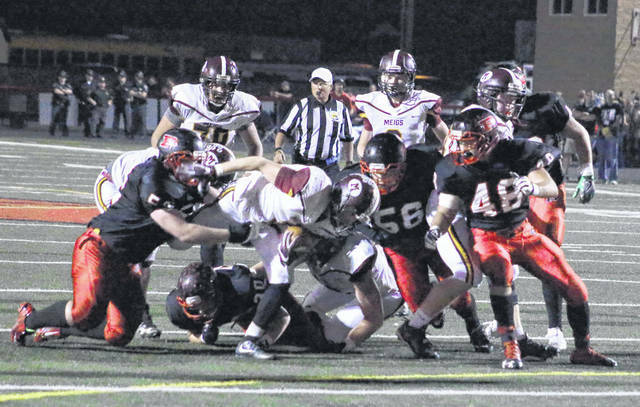 Point Pleasant is averaging 425.9 yards per game this fall, while scoring 37 points per game. PPHS has allowed 300.4 yards per game and 17.25 points per game. The Big Blacks hold a 144-to-112 advantage in first downs and a 14-6 edge in takeaways. 4. Both Point Pleasant and Man have fallen at Bluefield this season. The only other common opponent to this point in the year is Mount View, which the Big Blacks topped 35-6. The Hillbillies fell to MVHS by a 34-30 margin. 5. Point Pleasant is now 8th in the Class AA playoff ratings, in which Man is 39th. Point Pleasant is one of nine teams in Class AA with at least six wins. The Big Blacks have faced three of the other eight schools. Last Week: Wahama lost to South Gallia, 28-20, in Mason; Miller defeated Federal Hocking 35-8, in Hemlock. Last meeting between the teams: Oct. 21, 2016. Miller won 40-0 in Hemlock. MHS offense last week: 343 rushing yards, 164 passing yards. WHS offense last week: 398 rushing yards, 29 passing yards. MHS offensive leaders last week: QB Colby Bartley 5-8 164 yards, 2TDs; RB Zach Waldrop 16 carries, 178 yards, 3TDs; WR Levi Vnbibber 3 receptions, 131 yards, 1TD. WHS offensive leaders last week: QB Bryton Grate 2-5-0 29 yards; RB Christian Thomas 15 carries, 242 yards, 6TDs; WR Coltyn Hendrick 2 receptions, 29 yards. WHS defense last week: 177 rushing yards, 4 passing yards. 1. Last season was Miller’s first-ever victory over the Red and White in seven chances. MHS last visited Bachtel Stadium on Oct. 23, 2015, with the White Falcons earning a 39-21 win. 3. Miller has gained 1,877 rushing yards and 903 passing yards, with 25 rushing scores and 12 passing touchdowns this fall. The Falcons have intercepted eight passes, while only tossing three this fall. 4. So far this fall, both Miller and Wahama have defeated Federal Hocking and Eastern, while both falling to Waterford and Trimble. Miller has also earned wins over Belpre and Southern, with the Golden Eagles and Tornadoes both defeating Wahama. 5. The White Falcons are 25th in the WVSSAC Class A playoff ratings. A total of 20 Class A teams enter Week 9 with at least four wins. Miller is currently sixth in the OHSAA Region 27 playoff ratings, one of three TVC Hocking teams that would be in if the playoffs started now. Last Week: Hannan lost to Paden City 26-0, in Ashton; Gilmer County defeated Calhoun County 26-14, in Mount Zion. Last meeting between the teams: Oct. 21, 2016. Gilmer County won 55-6 in Ashton. Current head-to-head streak: Gilmer County has won 3 straight. 1. HHS and GCHS played eight consecutive years from 2006-2013. Gilmer County held a 6-2 record over Hannan in that time frame. 2. Hannan last defeated Gilmer County on November 4, 2011, by a 68-48 count, in Glenville. That game still stands as the Wildcats’ highest scoring game in over a decade. 3. The Wildcats have scored 94 points this season, with all but 12 coming in their two victories. Hannan has been shut out in three of its five setbacks this fall. 4. Gilmer County ended a six-game skid with last week’s 12-point win. Last fall when these teams met, the Titans were seven games into an unbeaten regular season. GCHS was ousted in the second round of the playoffs last fall. 5. Hannan is currently 31st in the Class A playoff ratings, while the Titans are tied for 36th with Buffalo. A total of 22 of the 43 teams in Class A enter Week 9 with a sub-.500 record.